john4jack (Corvallis, Oregon, United States) on 25 September 2009 in Sport & Recreation and Portfolio. @Miss Ruthie: Thank you. Albany is a little over an hour south of Portland. The Air Show was right off of I-5. Une photo d'une incroyable beauté ! Une fête pour l'oeil et le coeur ... BRAVO !!! This is a spotlightfoto, those colors, so so beautiful. 5 stars from me Jack, well done!! Almost looks like HDR. Is it? The colors are just magical. It is very joyful! @Dulcie: No HDR. In LR, I added a bunch of Fill Light because of the shadows. Added some Blacks, a little Vibrance and some Clarity. The brilliance of the colors is due to the materials and the light. Fantastic. I agree with Dulcie, the colours are magical. Very nicely done. Wow.. so much to see here.. again great shot. @djedfre: Most of the advertising was confined to the baskets. Excellent composition. With all this color its got to be tempting to just shoot away. @jeff (aka dogilicious): Thanks. To a degree, I did shoot away. Love that morning light! Well captured! What a feast for the eyes this shot is. The sort you can just sit back and look at for hours..It is simply sensational. If this isn't one of Aminus's featured pictures today I'll eat my hat. (Fortunately I have a hat made out of chocolate for just such unjust events!) Enjoy this shot....like I am! beautiful palette of colors and beautiful framing, jack! Good image, very festive. Colours and early morning light exellents. wow! Great photo, great colors! The vivid colors of the balloons makes the picture very appealing. I like how you have one balloon airborne. Colors are fantastic. This immediately drew me in.... great job. WOW I join the rest in saying those colours are fantastic, bravo! Wow, those colors are really great ... very vibrant but yet a nice warm color-cast! Fantastic photo! Stunning colors for this great shot!! Balloons make such great photo ops. Beautiful colors. @B. Thomas: Yes they do! Ah .. COLORS .. colors ... colors ... crazy colors :)) Crazy- super shot !!! A shot of many colours. I wish I could get to one of those balloon gatherings. I'm guessing this is very early morning, as they usually begin quite early to get things going. The light is marvelous and you captured the beautiful colors so well. @Judy: Txs. Read the commentary for Day 1. Magnificent colors and light... a very beautiful meeting. Don't you love that light? Fantastic. Love the saturation and the warm light in this one. Fabulous color and composition!! Superb! An excellent shot with great colors ! I love that riot of color. That's a superb composition with the one balloon floating up, up, and away. Great colors, like Steve just said, a "riot of color" is perfect to describe this photo. a great moment and super beautiful colors. I like the sunlight in the morning too. Une très belle lumière sur une image joyeuse très colorée. Oh Jack, Jack, Jack....I just LOVE this shot!!! The colors, and the sharpness, and golden late afternoon light......Just PERFECT !!!! @Susan: Thanks. It's early dawn light. Lot's of balloon!! Very colorful. Phenomenal use of color on this. Just incredible Jack. @Tammy-Cricket: Thank you for all of your kind comments. Beautiful! I love balloons! 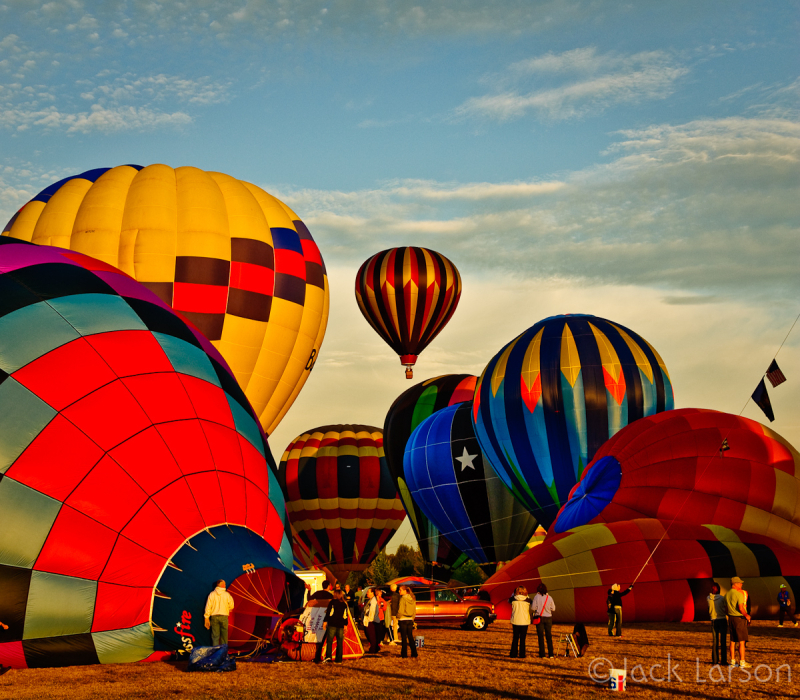 and this is a wonderful photo of them... Did you get to go up in one? @Tracy: Nope; just took pictures. SUPER SHOT! The colors are spectacular. I love it the way it is, although cropping off the bottom leaving just the balloons gives another version of the image. Although it may loose some of the bottom balloons. Just my opinion. First you have all of those gorgeous coastal images now balloons full of color. Both are high points on my passion list. I think this is my favorite balloon shot yet. @Barbara: I cropped it just for you. WOW! Actually I'm speechless, but I love the crop. Thanks, Jack. Are you pleased with it cropped as well? @Barbara: You bet! Thanks for the recommendation. Quite a capture of striking patterns and colors! I totally agree with Barbara! And the warm sunlight highlights the balloon's colors so well! Amazing colours! I'm absolutely loving this series!!!! Late to the party once again, but here's my comment. This is absolutely stunning! The colors are beyond amazing. Five stars!! What a beautiful day! The lighting is perfect and the colors so vivid. Great shot! Almost looks like HDR, beautiful colors and composition.. I love this shot so much!